Cordell Logan isn't a typical flight instructor. He is a retired black ops specialist and reluctant private investigator — reluctant because he isn't a professional. Trouble tends to find and force itself on him. He was forced into solving his first mystery when Arlo Echevarria, his former boss who stole his wife away, was murdered by a Domino's Pizza guy in Flat Spin. He is pushed into it again in Fangs Out, but this time for nothing as noble as winning over the affections of his ex-wife. He needs the money. Fangs Out is a sequel with a little less action and a little more mystery. There are other reasons to accept the assignment from famed Vietnam War hero pilot Hub Walker in La Jolla. The job is unusual but sounds like a slam dunk. The way Logan sizes the job up, he'll have some extra time to rekindle a romance with his widowed ex-wife. She lives in the area, which makes the title fit all the more. Logan is hot for a dog fight, one that leaves him just enough time to win over the woman he still pines away for. What he doesn't know is that the dog fight will come someplace else — unknown adversaries who intend to keep him from any prize. The mystery itself starts just moments before Dorian Munz, the killer of Walker's daughter, implicates a prominent U.S. defense contractor instead. The press have a field day with the revelation. Munz gives them a motive. And the accused, Greg Castle, is Walker's best friend and his daughter's employer. Walker wants his best friend's name cleared. If Logan can do it, the pending payday is $10,000. But nothing is ever as easy as it seems. Someone doesn't want the truth to come out. And shortly after Logan lands his beloved Cessna, the Ruptured Duck, in San Diego, he becomes a target too. Cordell Logan is an enigma, a sarcastic contradiction. When Logan gave up his career as a contract killer for the military, he vowed to become a peaceful player. He now works as a civilian flight instructor with a single student. He follows Buddhism to the best of his ability. He rents a garage room from an 88-year-old landlady. And he owns a weight-challenged cat that pretends not to love him. It's not much, but he survives. There is something else about Logan you need to know long before you pick up the book. He never met a cliche that he didn't like and frequently spouts out one liners, even in the face of mortal danger. It's almost like an addiction and is patently distracting when tied to action, which there is much less of in this more cerebral and slow-burning cat-and-mouse mystery. There is no question that author David Freed cranks up the wit and chronic sarcasm in an attempt to make his comedic mechanism intentional. Plenty of people will appreciate it but some not so much. The difference between Logan and other comedic characters is that nothing terribly funny is happening in the story. Logan merely makes insider jokes about everything and only he and the reader are privy. Sometimes it works and sometimes it falls flat, making Logan one part humorous and two parts annoying. Not all of his annoying traits are caused by quips alone. He is a chronic whiner, which might even explain why so many people like him but nobody really respects him, not even his cat. 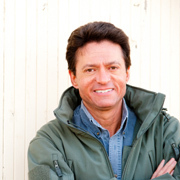 David Freed is fine storyteller who shares a passion for flight. Even with the aforementioned shortcomings, Freed is an author that you want to cheer on. He is immediately likable, approachable and appreciates what it takes to build out a mystery cut from a film noir cloth. Never mind that the characters lean a little toward being cutouts. You can't guess at the end. You also can't call every character a cutout. As impossible as it seems at times, the smugness isn't exclusive to imagination. Before becoming a novelist, Freed had worked as an investigative reporter, embedded journalist and with the U.S. intelligence community. Much like flying, being abuzz in sarcasm is likely a trait the character and his creator share. Fangs Out By David Freed Flies By 5.2 On The Liquid Hip Richter Scale. 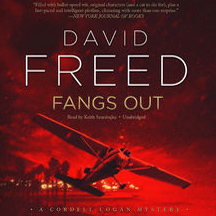 Fangs Out is an entertaining who-done-it noir mystery with a little less action than the Cordell Logan debut. Freed keeps it fresh and moving even as his reluctant modern day private investigator is grounded throughout much of the book. There is an evolution here and it will be interesting to see where it might head next. 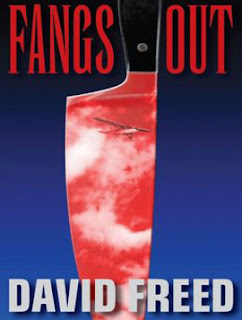 Fangs Out by David Freed can be ordered from Barnes & Noble or you can find Fangs Out (Cordell Logan Mystery) on Amazon. You can also download the audiobook from iTunes. The book, read by Keith Szarabajka, recasts Logan with a more gravelly and less lively narration. While Szarabajka is fine, Ray Porter made the better Logan. Stick to print this time and keep an eye out for appearances by the author.